Bound Book of Remembrance with hand-written inscription and names on antique vellum. Vellum leaves date to 1777. Wall-mounted stone stand with stone tablet, supported by bracket. Crucifixion in relief in centre of tablet with floriated border in relief. Inscription in relief at base. A brass vase and two Books of Remembrance on a thin brown cushion rest on stand. Brass plaque with dedicatory inscription mounted on stand ledge. 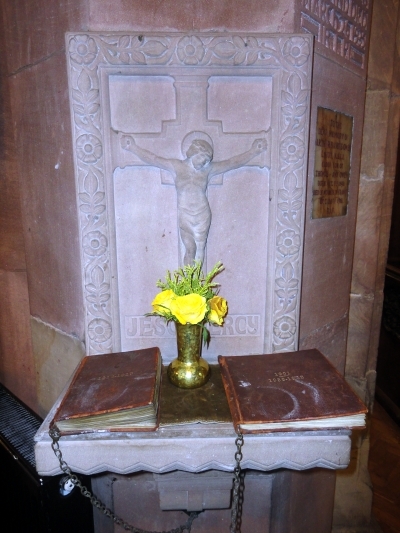 Books chained to wall-mounted stone stand inside St. Deniol’s Church, Hawarden. Photographs taken by Mavis Williams 28th July 2017. COUNTY OF FLINT WAR MEMORIAL. The Chairman read a circular letter from the Lord Lieutenant of the County, and also from the Secretaries of the County of Flint War Memorial Committee, asking the Council to take steps with a view to co-operating in the County of Flint War Memorial, and appoint a Committee of local ladies and gentlemen for the purpose of preparing a complete list of Ex-Service men for the County record, and to arrange for contributions to the fund. It was explained that the Memorial should take the form of a personal representation of a specially designed Commemorative address or Souvenir, and the compilation of an historic County Record. A Commemorative Address recording individual service and indicative of the deep and abiding gratitude of the citizens of Flintshire would be given to each man and to the relatives of the fallen by H.M Lieutenant for the County of Flint. The Chairman said Miss PARRY would be quite prepared to take in hand the preparation of a list of Ex-service men in the Urban Area. Councillor J. Wynne WILLIAMS proposed. Councillor T.G.WYNNE seconded. That Miss Parry’s kind offer be accepted. A Sub-Committee consisting of Councillor PARKINSON, MARSTON, B. WILLIAMS & THOMPSON, was appointed, with a view to making some effort for supplementing the County Fund. 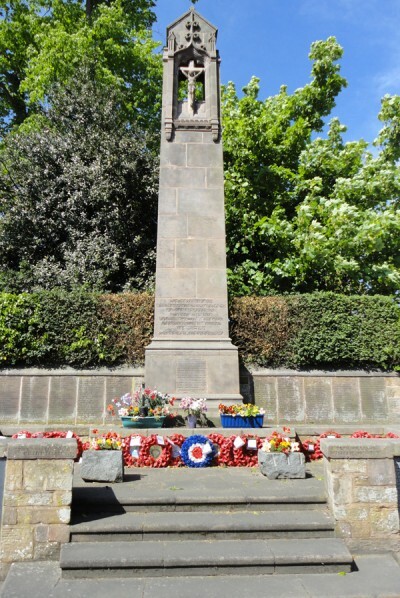 In the middle of the village of Hawarden, made famous as the home of the Gladstones , there now stands a memorial of two hundred and ten men from the wide parish of Hawarden who made the supreme sacrifice in the recent war. The memorial was unveiled and dedicated before a large concourse on Sunday. With rain threatening, those who mourned gathered in their parish church to the sound of muffles bells. By the time the Rector (the Rev. the Hon. C.F. Lyttleon, M.C.) opened the impressively simple service with the words, “I am the resurrection and the life” sung by a choir augmented from the daughter churches of Hawarden, the church was crowded. The psalm for the service, cxxv., “They that put their trust in the Lord,” was followed by the reading of the lesson. Here the Rev. Mr. Burnham, the United Methodist minister of Hawarden read I Thess. 13-18, and then the choir sang the anthem “Jerusalem.” Special prayers followed, and after the singing of the hymn “For all the saints” the Rector delivered an impressive address, in the course of which he said they are assembled with two feelings uppermost in their minds – they were there as mourners for those who laid down their lives for their King and country and with the hope of a re-union. With these two thoughts in their hearts they could go forth to the unveiling ceremony and the dedication of the memorial to those of their brothers who had laid down their lives. This brought the service in church to a conclusion. Headed by the cross, the clergy and choir walked in procession to the memorial, singing the hymn “Let saints on earth in concert sing.” During Saturday afternoon the Hon. Mrs. H.N. Gladstone and other ladies stood at the memorial to receive gifts of flowers which were laid wound the obelisk. Other floral tributes were carried there on Sunday until by the time the Lord Lieutenant of Flintshire (Mr. N.H. Gladstone) took up his position on the steps of the memorial, with the clergy and choir in front of him and the vast crowd around there was a bank of flowers which covered almost the whole space at the base of the memorial. The hymn “Praise, my soul, the King of heaven” was sung, and then the Lord Lieutenant performed the ceremony. Before unveiling the memorial Mr. Gladstone said that to to erection of the village cross the various districts of the ancient parish of Hawarden contributed by large or small donations, according to their circumstances. When the call came in 1914, Hawarden, Flintshire, and the whole of Wales responded nobly and in numbers second to no part of the United Kingdom. About 1800 men of their wide spread parish joined the naval and military services to fight for King and country. Some 1600 came back, and the names of twelve in every hundred – 210 in all – they commemorated there. They were gathered together from all parts of the parish and it was for him, on their behalf, to do honour without distinction of name to them. Why were such memorials as that being placed all over the country? The reason was not far to seek. The heart of the whole nation united as never before in history in one desire to commemorate those whom they honoured and loved. They were honouring the dead, but the thought would come to some of those present. “My name might also have been on the memorial.” Yes, we must never forget them, our brave men who faced the same hard-ships, and the same risks, but who were, thank God, with them that day. The memorial must ever remind them of the purpose a\nd the meaning of the war as well as of the supreme sacrifice of more than 600,000 British lives. Mr. Gilbert, formerly a staff-sergeant of the 5th Royal Welch Fusiliers, sounded the “Last Post,” and after two minutes of profound silence had been observed he sounded the Reveille. “O God, our help in ages past” was then sung and to Mr. T.H. Haswell (clerk to Hawarden Parish Council) Mr. Gladstone handed the deeds of the memorial which is to be preserved inviolate in perpetuity. Accepting the charge Mr. Haswell said the memorial would be cared for in a manner worthy of that ancient and loyal parish, and worthy of the glorious dead whose names were commemorated thereon. Last Sunday afternoon the Lord Lieutenant of Flintshire and the Hon. Mrs. H.N. GLADSTONE, gave what may be termed as “official” garden party at Hawarden Castle, to which had been invited representatives and the various public authorities of the county, with their wives and daughters, to the number of several hundreds. Fortunately, the weather proved most propitious; in fact a more suitable day for such a function could hardly be imagined. The beautiful gardens, grounds and park were looking their best, while the Castle itself was of course the centre of much interest as the former home of the illustrious man who has immortalised the name of the pleasant little village of Hawarden. By the kindness of Mr. & Mrs. GLADSTONE the principal rooms were thrown open for the inspection of the guests during the afternoon. The guests entered the Castle through the beautiful porch which was added to the Castle in 1889, by their family and relatives, in celebration of the golden wedding of the late Mr. & Mrs. GLADSTONE. The rooms were observed to contain several beautiful pieces of decorative and antique furniture, as well as oil portraits of the late Mr. & Mrs. GLADSTONE and other members of the family. But the greatest interest was, of course, centred in the “Temple of Peace,” the library of the late Mr. GLADSTONE, where he wrote his famous ” Studies on Homer and the Homerite Age,” as well as other works which made his name no less prominent in the literary than in the political history of the nineteenth century. It was observable that the shelves were well stocked with books, notwithstanding the fact that the late Mr. GLADSTONE transferred such a great number of his books to the St. Deniol’s Library. Upon one of the tables in the room was displayed a collection of formidable-looking woodman’s axes which the great statesman was wont to lay to the roots of such of the trees in the park as he considered wee ripe for felling. Upon entering the grounds the guests were cordially received by both Mr. & Mrs. GLADSTONE, who were accompanied by Mrs. WICKHAM (widow of the late Dean of Lincoln) and Miss Helen GLADSTONE. The guests then passed on and looked over the beautiful flower garden and grounds, and also inspected the still noble ruins of the ancient castle, upon the summit of the tower of which a flag was flying in honour of the occasion. The castle is believed to have been built in the thirteenth century, and possesses a stirring history. During the afternoon two short concerts were given in a tent pitched upon the the small green beneath the old castle. The artistes were Miss Dilys JONES (who rendered songs, Miss Clara EISSIER (harpist, the well-known Czech performer, and Miss Mary CARMICHAEL (accompanist). The various items were all beautifully rendered, and gave great pleasure to the company. At intervals the Royal Buckley Town Band gave enjoyable selections of music. Tea and light refreshments were served to the company in a tent below the terrace. At half-past five o’clock a very interesting little ceremony took place in the tent by the old Castle, ands which was described as “Formal acceptance of the Roll of Honour and Services of the Men of Flintshire who fought in the Great War 1914-1919, for the safe custody by His Majesty’s Lieutenant on behalf of the County.” The tent was crowded during the proceedings, which, though brief, were of deep significance as a reminder of the five years of trial through which Flintshire, in common with the rest of the country, passed during the war. “I have the honour, as Lord Lieutenant of the County of Flint and as Chaiman of the Committee responsible for the arrangements in connection with the Flintshire War Memorial, to present to you a short report. Shortly after the Armistice there was a general feeling in the country that something should be done to express the gratitude of the inhabitants of Flintshire to the men who had served in the Forces of the Crown during the Great War, and also to perpetuate the memory of the men who had made the great sacrifice on behalf of the principles and ideals for the defence of which our country had entered the war. I accordingly convened a meeting of the representatives of the public bodies in the county, and the whole question was then fully discussed, and the exact form of memorial was left to a small Executive Committee. The committee appointed comprised the following gentlemen: – The Lord Lieutenant for the County, Alderman Trevor EYTON (who was then chairman of the County Council), Councillor John BROOKES (chairman of the Rhyl Urban District Council), Councillor A. EVERALL (chairman of the Buckley Urban District Council), Councillor Thos. PARRY ( chairman of the Mold Urban District Council) the late Lieut.-Colonel M. KEENE, and Mr. F. Llewellyn JONES. This committee, which had power to co-opt such additional members as it decreed desirable, co-opted the following:- Lieut. Colonel Freer ASH and Mr. Henry POWELL (Mayor of Flints), who consented to act as honorary treasurers, and Mr. E. George EVANS (Rhyl) and Mr. Joseph FORBER (Connah’s Quay), who were appointed honorary secretaries. The Committee resolved that the Memorial should take the following form: (a) A commemorative certificate or address to be presented to every Flintshire man who had served in any branch of His Majesty’s Forces: (b) an address to be presented to the relatives of the men who had fallen; (c) a complete record of all men who had served, indicating their full names and addresses, the units in which they had served, indicating their full names and addresses, the units in which they had served and the distinctions gained, and also including the names of men who were killed or died as a result of war service. The honorary secretaries placed themselves in communication with the Urban District Councils and the Parish Councils in Flintshire, and these Councils practically without exception arranged for the formation of local committees to obtain the necessary information. The preparation of a record of this character, naturally involved a considerable amount of work, and I should like to express my personal appreciation of the thorough manner in which the local committees compiled the records for their respective districts. After the record had been completed locally upon cards*(see below) sent to each district, these cards were collected and the certificates and memorial addresses were filled in by a small staff of clerks under the supervision of the late Colonel KEENE. Public meetings were afterwards held in the various towns and villages of Flintshire, and the addresses were presented to the men who were still with us and to the relatives of the men who had fallen. As Lord Lieutenant of the County I was privileged to be present at most of these meetings and to make the presentations, and the large attendance of ex-service men and their friends was a gratifying recognition of the fact that Flintshire had adopted a method of commemorating the Great War which met with general approval. The writing of the complete record in book form was afterwards entrusted by the committee to Mr. Albert EDWARDS, of Mold, and the handsome volume which comprises this record is now available for public inspection. A statistical statement showing the number of men who served from different parts of the county had been prepared, but it is only possible in this report to give the following brief summary for the whole county: – Total number of Flintshire men who joined H.M. Forces, 10,770; number of Flintshire men who fell in the Great War, 1,264. The Record Volume will for the present be available for inspection at certain towns in Flintshire. Having regard to the cost which has been incurred with the preparation of the volume, and the practical impossibility of replacing it if it were lost or destroyed, proper guarantees will have to be given for the safe custody of the volume. Ultimately I think it will be appropriate that the volume should be deposited at the Nation Library of Wales in Aberystwyth, where it will be a memorial for all time of the part played by the manhood of Flintshire in the Great World War. In presenting this report it is with no small amount of pride that I record the fact that Flintshire is the only county in Wales that has taken steps to compile a complete list of her sons who responded to the call of King an Country. I should not like to close my report without giving my personal testimony to the invaluable assistance rendered to the late Lieut.-Colonel KEENE, whose early death we all deeply deplore, and also by the honorary Treasurers and the two honorary secretaries, to whom energy and untiring labours the successful completion of the memorial is mainly due. A financial statement which has been prepared by the hon. Treasurers will in due course be sent to all subscribers to the fund which has raised for the purpose of meeting the expenses in connection with the memorial. The Lord Lieutenant concluded by proposing a vote of thanks to the executive officers, who, he said, had really done the work in this matter..
Capt. Albert C. GLADSTONE ( the Lord Lieutenant’s nephew), in seconding the proposition, said he was sure the preparation of the great volume would be appreciated by all ex-servicemen of the county, who would regard it as a testimony to their services in the Great War (hear, hear). The propositions having been carried, the proceedings terminated. The company afterwards inspected the volume, which is a ponderous though beautiful one. The whole of the names, etc., have been written by Mr. Albert EDWARDS, who is in the offices of Messrs Hugh COOKE and HALLETT, SMITH, of Mold, and the whole get-up affords him the greatest credit, as the amount of labour, patience and perseverance involved must have been enormous. The volume is bound in Royal blue morocco, with inscription in gold on the front cover. It is understood that for a time the book will be deposited for inspection at St. Deniol’s Library, after which it will, subject to suitable arrangements being made, be exhibited at three or four centres in the county. After this has been done, the precious volume will be delivered for preservation by the Lord Lieutenant as “Custos Rotulorum” of the county. Flintshire Observer – 28th July 1922, the event took place on the 22nd July 1922 according to the Hawarden Events Book. One of the most delightful social functions associated with Flintshire took place at Hawarden Castle on Saturday when by the invitation of the Lord-Lieutenant of Flintshire (Mr Henry N. Gladstone) and Mrs. Gladstone over a thousand guests attended a garden party heId in the grounds of the castle. Delightful weather favoured the proceedings, and thus the afternoon’s varied programme was carried out without a hitch. Mr. & Mrs. Gladstone received the guests on the terrace made famous by the fact that from the wall of it the “G.O.M.” made several great speeches. Following the reception, a short concert programme was enjoyed, the artistes being Miss Dilys Jones, Miss Clara Eissler (harpist), and Miss Mary Carmichael, who acted as accompanist. Tea and light refreshments were served in a large tent and in the park grounds, after which the company assembled to witness the formal acceptance of the roll of honour and service of the men of Flintshire who fought in the war by the Lord-Lieutenant on behalf of the county. 10,770 Flintshire Men in the Forces. proposed a vote of thanks to the subscribers. Capt. Albert Gladstone seconded and the vote was duly accorded. Below – Taken from the Hawarden Events Book- re the War Memorials and the Flintshire WW1 Index Cards. 1919 – On 23rd June a convention of representatives of all sections and classes was held at Chester by invitation of Henry Neville GLADSTONE, followed by a further meeting a week later to consider the form in which the County should recognise the services of all who had fought for their country who belonged to Flintshire. It was decided that suitable Commemorative Addresses to be drawn up and signed by Henry Neville GLADSTONE on behalf of the County, well engraved and illuminated, should be presented. 28th June. On this day the Peace Treaty was signed at 3pm at Versailles by the Allies (America abstaining*) & 2 representatives of Germany. On July 12th Henry Neville GLADSTONE issued a notification to Public Bodies in the County as to the presentation of Commemorative Addresses to Ex Service Men and to the representatives of the Dead. 1922 – In April Mr. Henry Neville GLADSTONE gave various plots of land at Shotton, Queensferry, Broughton & Buckley for Sports & Social purposes in memory of those who fell in the Great War, on behalf of the settled & Hawarden Castle Estates. 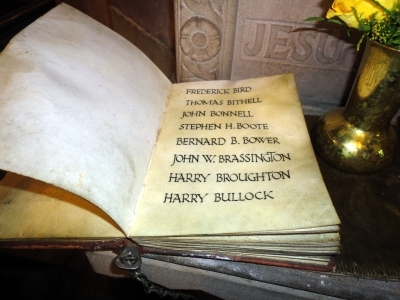 22nd July The County Record of all who had served in the Great War 1914 – 1919 in a magnificent book was exhibited and handed over to the Lord Lieutenant for safe Custody.